“I hate crabgrass!” is a common lament I've heard from residents during my 35 years as a UCCE Weed Science Farm Advisor. However, four out of five times, the weed people are actually referring to is not crabgrass, but bermudagrass or dallisgrass. So why does knowing the name of the weed matter? It doesn't—unless you are trying to control it! There are two annual weed species of crabgrass: large crabgrass and smooth crabgrass. 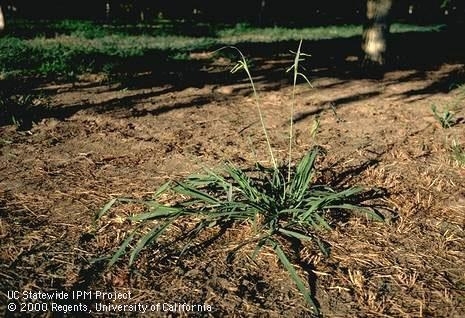 Large crabgrass, sometimes called hairy crabgrass (Digitaria sanguinalis), has leaves that usually appear grey with a hairy upper surface (Figure 1). If unmowed, the leaf sheath can grow upright to a height of 2 feet. Large crabgrass is commonly found in gardens and landscape areas. 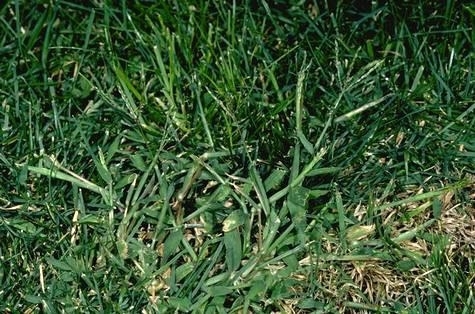 Smooth crabgrass (D. ischaemum), is usually light green in color (Figure 2) and as the name indicates, it appears smooth. The leaves do have some hairs, but they are not as prominent as those found on large crabgrass. Left unmowed, smooth crabgrass can grow to a height of 6 inches tall. It first appears in open areas in the lawn such as the edges or areas cut around sprinklers. Each winter (as early as January in Southern California and late February in the North), very small, light green single leaves begin growing flat on the ground, often in turf areas. While annual crabgrasses can be a problem, they pale in comparison to the perennial weeds bermudagrass and dallisgrass. 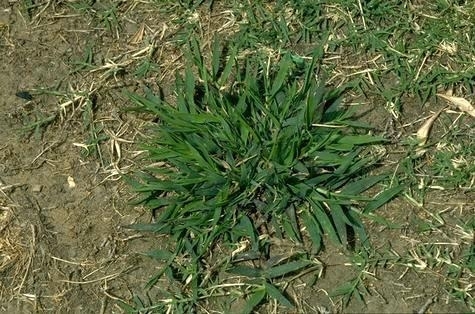 Learn more about crabgrasses in the Pest Notes: Crabgrass. 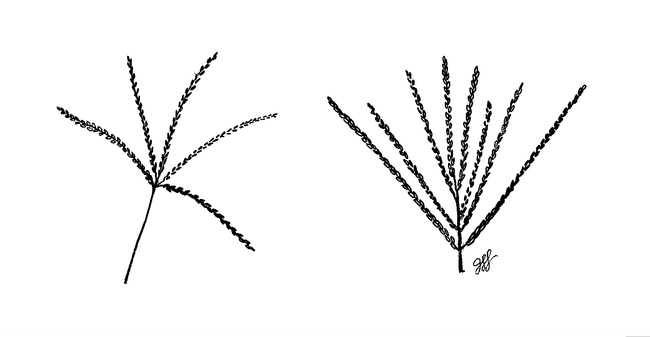 Bermudagrass (Cynodon dactylon), is a low-growing, wiry perennial that has two types of shoots: stolons that grow above ground (Figure 3), and rhizomes that grow below ground. Stolons and rhizomes are capable of rooting in soil and creating new plants as they grow out from the original plant. They can also grow when they are cut and left on moist soil. 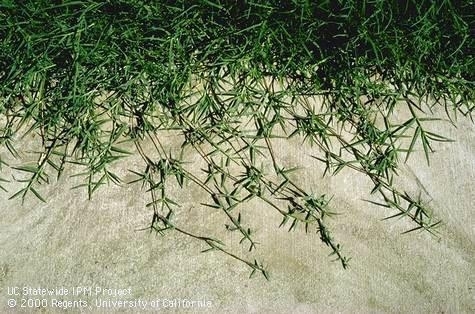 Although bermudagrass can spread by seed, it usually spreads in lawns and gardens by stolon. Common bermudagrass and hybrid varieties can be used as a lawn in some areas of the state. In this article, we are talking strictly about bermudagrass as a weed. Bermudagrass is hard to pull out and is very tolerant of both drought and mowing. The seed heads look very similar to those of crabgrass (Figure 4). Unlike the other two weeds discussed, bermudagrass can be very invasive in lawns and gardens. Learn more about bermudagrass by reading Pest Notes: Bermudagrass. 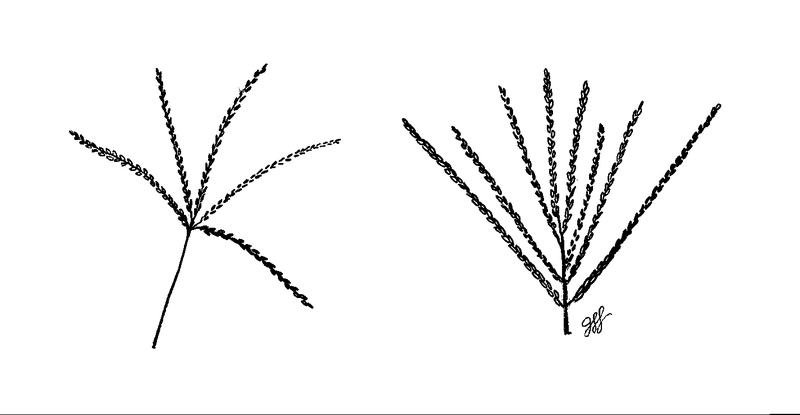 Dallisgrass (Paspalum dilatatum)is a coarse-textured perennial that grows in a clump (Figure 5). It slowly increases in diameter as its shallow, underground rhizomes grow outward. 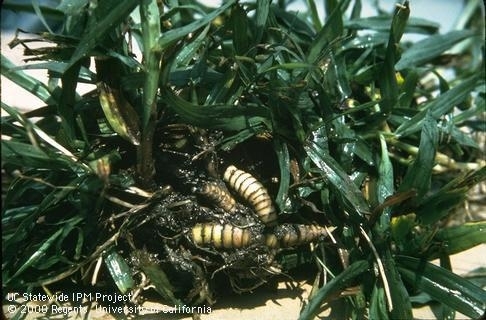 The rhizomes have short internodes (the length of stem between the joints) that look like concentric rings on its surface and resemble grubs or worms (Figure 6). Dallisgrass is a problem in many areas because it is adapted to inconsistent irrigation and fairly close mowing; the seed heads grow almost parallel to the ground and are often missed by lawn mowers. Learn more about dallisgrass in the Pest Notes: Dallisgrass. Dallisgrass is easy to distinguish from crabgrass and bermudagrass because it grows in clumps, is green year-round, the stems are flat, and the flower heads droop rather than appearing as upright fingerlike spikes. As mentioned already, crabgrass and bermudagrasss have similar fingerlike flower heads but crabgrass has wider leaves than bermudagrass. The stems of large crabgrass are often purple. Bermudagrass grows in long, wiry, trailing stems with leaves that are generally smooth and pointed, and a conspicuous ring of white hairs at the junction of the blade and sheath. How are these weeds controlled? Because crabgrasses are annual plants, reducing the amount of shallow irrigation helps reduce their germination and growth. In gardens, use drip irrigation, which works best when buried. In lawns, replace short, daily watering with fewer but longer (deep) irrigations. This allows the top to dry out, and encourages the deep-rooted perennial lawn species growth. To manage crabgrass, raise the height of your mower; this has been shown to make lawn more competitive. Although raising the mowing height helps slow bermudagrass growth, changing irrigation practices will not discourage, and may in fact encourage­­ both dallisgrass and bermudagrass once they are established. Because of their perennial structures, these plants must be removed either physically or chemically. Bermudagrass can also be controlled in the garden by drying it out for an extended period or by using soil solarization. Finally, many people use “crabgrass weed and feed” for weed control. This product is a combination of lawn fertilizer and preemergence herbicide. If applied before crabgrass emerges in your lawn, it can be very effective. However, if the weeds are bermudagrass or dallisgrass, the preemergence herbicide may control some of the emerging seedlings but will not control (and may actually increase) the infestation of these two weeds. Proper identification and knowledge of weed biology, such as germination time and life cycle, is the first step in any effective weed management attempts. For more help identifying weeds, visit the UC IPM Weed Gallery.